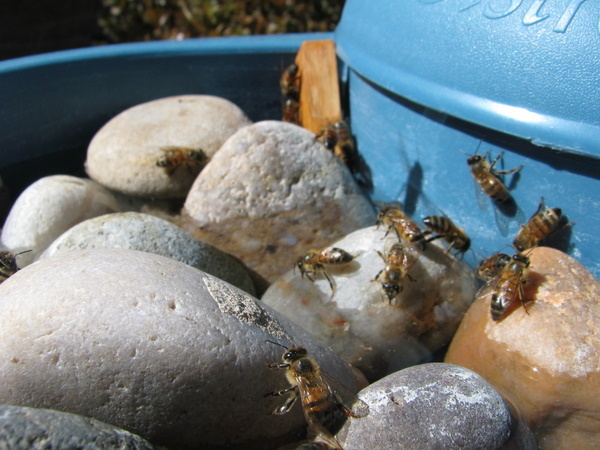 For urban beeks, providing a clean water source for your bees is the best way to ensure they don’t take a fatal dip in your neighbor’s pool or flash mob the dog bowl. 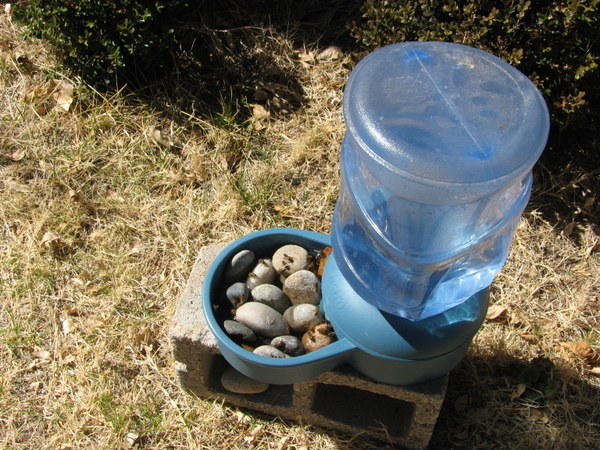 We’ve found a pet waterer filled with rocks at the base is the easiest way to water bees. Looks a little weird, but who said beekeeping was glamorous? 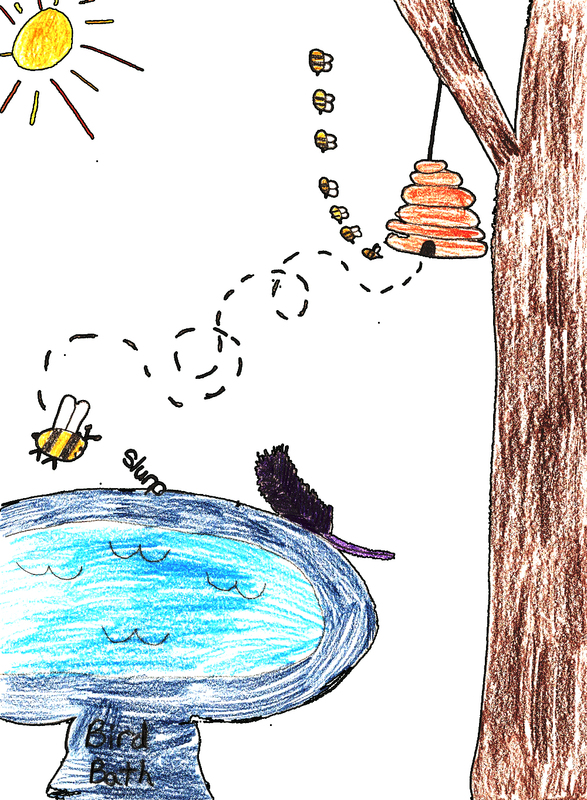 Our Beehives are next to our our pond in the garden – I love watching the bees drink fro the lily pads or the edge of the pond. It’ll be another month at least for our bees to need water here! I always start putting it out way before warm weather so they know where to go (NOT to the neighbors!). I’m totally envious of your weather!! What is/are your bees’ principle pollen and nectar sources? What are your favorite “bee plants” (besides sunflowers)? If you do a web search you will find that some beeks add essential oils & apple cider vinegar to the water they give the bees. Not so much as an attractant but as a supplement. Our bees aren’t quite needing water yet, but they will soon. Last year they spurned the water we put out for them, and instead prefered water in an old planter saucer near the hose bib. Hi Margaret, so interesting! We’ve found that our girls like stinky swamp water as well, to the point where we’ve wondered if it’s actually healthy for them. hi fellow bee lovers… last year I put water out in my front yard and back yard for the bees because we had an extremely hot, dry summer. I noticed that bees in the front yard would visit the water, but bees in the back yard never would. Are the bees so territorial that the front yard bees stayed only in the front, and the back yard bees only in the back? I’m wondering if the front bees were conditioned to accept the water for some reason… or is it more likely that one watering location felt safe and the other had issues about where/how it was situated??? Any advice? I grew up in a small town called Fruitdale, SD. Which had 3 honey houses. In the early 1900’s was the honeybee capital of the world. In our small country school we studied much about bees. They are fascinating creatures. Hi Kathi, thanks for stopping by! It’s hard to tell the exact cause of your backyard water source being ignored but IMHO it’s most likely that area bees (which don’t necessarily constrain themselves to front yard and back yard) just preferred the front yard source for some reason. Maybe it was in shade? Or maybe sun? Or maybe you kept it more steadily replenished? Great idea for a water source! It’s very dry here (typically) in CA and I’ve been thinking about options for my bees that are due to arrive mid April. I’ll definitely keep this in mind.